Zombie Week: The undead are coming! Smash the undead. Or better yet, freeze them and then blow them up. How about dropping several tons of weight on their shambling corpses? No? Well, you can always fry them or shoot them. ZombieSmash, developed by Game Doctors, lets you dispatch the zombie hordes with unrivaled variety and power. Zap, pummel, and shoot—the choice is yours. Due out later in March and priced at $2, this funny and quirky zombie app looks like a title to watch. It's not cruel when they're already dead. Released last week, the trailer reveals the game will feature an expansive arsenal of over 20 weapons that would put even Ash Williams to shame. Sniper rifles, fire, rocks, asteroids, wrecking balls, shotguns, and many more weapons can be unlocked and used to absolutely decimate the hordes. Thanks to a fantastic use of ragdoll physics (called the “SplatterEngine,”) the animated carnage is both humorous and awesome to look at. You can watch as the zombies fly all over the scream when struck with a wrecking ball, effectively covering the screen with adorable zombie limbs and guts. The “meat” of the game will be a Campaign mode where you’ll have to survive for 31 intense days. There is also a Sandbox mode for you to play around with the different weapons without the threat of being eaten. You can experiment with combinations of different attacks or just try out new weapons. In the trailer, the player froze an oncoming group of zombies and then smashed them to pieces. The soundtrack has been composed by Chris Hulsbeck, who is also responsible for the soundtracks of games like Turrican, Giana Sisters, and the Star Wars: Rogue Squadron series. 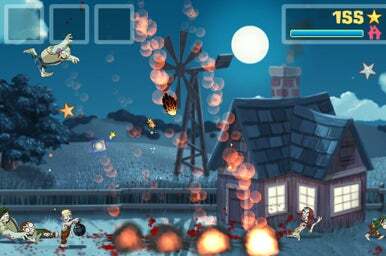 Whether you’re a fan of zombies or a tower defense fan or just like clever uses of the iPhone’s touchscreen, ZombieSmash looks worth a look when it rises from the grave this March.